Michael J. North, Head of Rare Books and Early Manuscripts in NLM’s History of Medicine Division, takes a look at one the highlights of the Library’s Turning the Pages project, a Mongolian manuscript concerned with interpreting the heavens. In 2001, the National Library of Medicine (NLM) launched Turning the Pages, a resource providing interactive access to a range of rare books, manuscripts, and documents from the historical collections of the NLM on its website, via iPad App, and in onsite kiosks. To date, the project has offered the public access to a wide range of early printed books and manuscripts that span centuries, cover topics from surgery and anatomy to botany and horse veterinary medicine, and originate from places as diverse as Iran, Japan, Egypt, Italy, and now Mongolia. 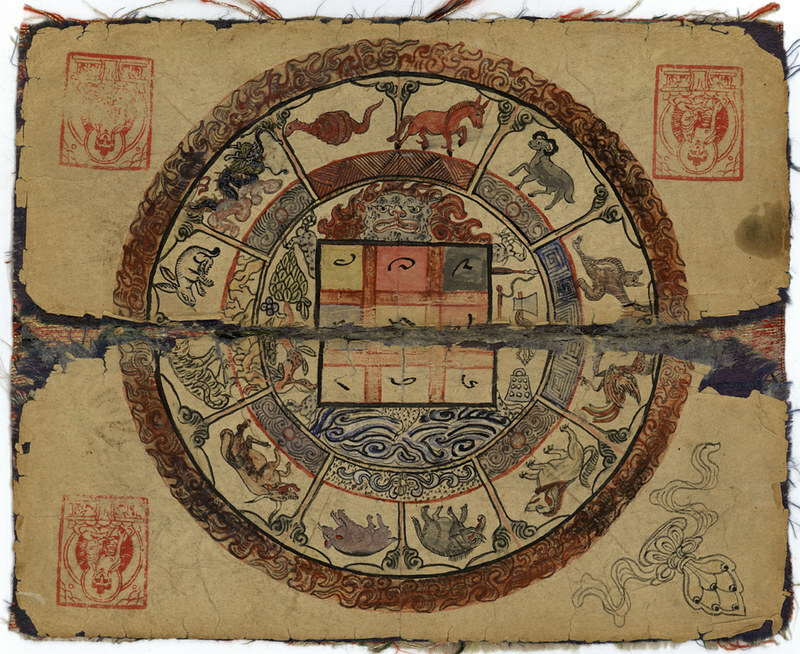 In November 2014, the NLM added a Mongolian manuscript entitled Manual of Astrology and Divination.This colorfully illustrated handwritten book is part of a collection at NLM of about fifty manuscripts from Mongolia, many of them dealing with astrology, astronomy, and divination from a Buddhist perspective. Prominent among the subjects divined about are health and wellness. This particular manuscript is full of charts and diagrams that astrologers, generally Buddhist monks, would use to calculate auspicious times to do certain things, such as depart on a trip or remove a dead body from a dwelling. “Basics of Mongolian Astrology” . The text itself is in Tibetan, which was the liturgical language of Mongolian Buddhism. Similar to Tibetan traditional books, this manuscript consists of unbound, oblong leaves of paper written on both sides. Also following tradition, the book is wrapped in a silk cloth with strings tying it up into a tight bundle. The hand-made paper was likely imported, the inks and dyes used for the manuscript were most likely hand-made locally, and it was probably copied by a professional monk-scribe. While it was copied sometime in the 1800s, the information in the text is likely to be many centuries old.Most Mongolians are followers of Buddhism, a religion which originated in India and came to Central Asia via the Silk Road in the 3rd century CE and from Tibet and China during the era of the Mongolian Emperor of the Yuan dynasty, Kublai Khan in the 13th century. 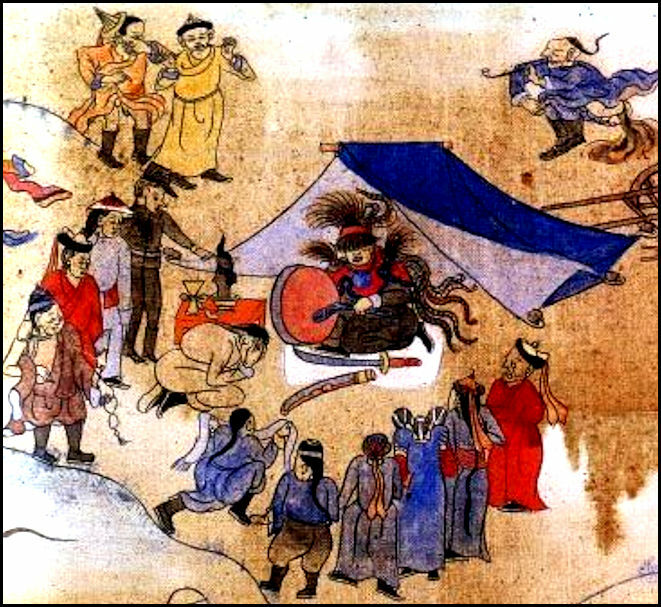 Because of this, Mongolian astronomy and divination were heavily influenced by Indian, Tibetan, and Chinese traditions. The many colorful charts in this manuscript were based on astrological texts imported to Mongolia from Tibet in the late 1700s. Much of this philosophy was laid down and taught in Tibet and Mongolia by Sumpa Khenpo Yeshe Peljor (1703–1788), a Mongol Buddhist monk and master of both astrology and medicine from Amdo, one of the traditional regions of Northern Tibet near modern-day Mongolia. In 1789 a school for the study and practice of astrology based on his teachings was established in Urga, modern-day Ulan Bator, which is today the capital of Mongolia. The charts on this leaf, pictured above, refer to a text used for the calculation of the stellar constellations (skar ma) and corresponding fluctuations in Naga or serpentine energy. In the tables, the 28 lunar mansions, or segments of the lunar ecliptic, are each given by name. Nagas are powerful spirits of the underworld that take the form of snakes (sprul) and half-snake/half-human creatures (klu). Naga energy has an important effect on human health, wealth, and weather, and this kind of divination chart is used to determine Naga offerings and practices.The selection of images and curatorial text for the manuscript’s appearance in the Turning the Pages project were carried out by Dr. Uranchimeg “Orna” Tsultem, a native of Mongolia. Dr. Tsultem holds a PhD in Art History from the University of California at Berkeley, where she has served as a lecturer on the Art of Mongolia and Tibet. She has curated a number of exhibitions on Mongolian art internationally, including in Hong Kong, Shanghai, New York, and Bonn, Germany. She currently holds a faculty position as an Associate Professor at the National University of Mongolia, and is working on several research projects, which include contemporary women’s art; she is also writing a book on Mongolian Buddhist art. The interactive project is viewable on two kiosks at the National Library of Medicine, on the Library’s website, and now also in the Turning the Pages App for iPad available for free. For more information about NLM’s collections relating to Mongolia or to the Turning the Pages project, please contact us at hmdref@mail.nlm.nih.gov. To learn more about the Turning the Pages project visit the website. To browse more of the National Library of Medicine’s wonderful pool of public domain material visit their Digital Collections section. We also highly recommend checking out their excellent Circulating Now blog, from which this piece from Michael North was adapted.This post is part of our Curator’s Choice series, a monthly feature consisting of a guest article from a curator about a work or group of works in one of their “open” digital collections. The series is undertaken in partnership with OpenGLAM and made possible through funding from the European Union’s DM2E project.